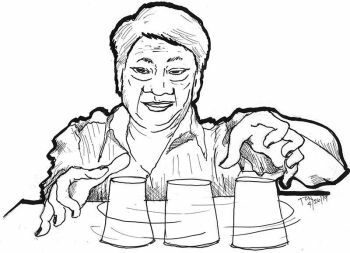 WHY would the Cebu City Government distribute the next tranche of senior citizens’ financial assistance in private residences and through private individuals? This was the question posed by some members of the City Council, who warned the executive department of possible administrative liability considering that the transaction involves around P13.4 million in public funds. The City is scheduled to release P2,000 on Aug. 20 to each of 67,300 senior citizens. In a privilege speech during the council’s regular session yesterday, Councilor Jose Daluz III, a lawyer, said he is very much concerned about the matter. “We have a valid ordinance. The distribution of the financial assistance is sourced from public funds, thus, it should be given in areas which are public in character like barangay halls, sports complexes or schools. Why would a private citizen be involved in the giving of the cash aid?” he said. In Barangay Calamba where he resides, Daluz said he was informed by the barangay officials that the distribution of the P2,000 cash assistance will be coursed through Jojo Quijano, a supporter of the Bando Osmeña Pundok Kauswagan (BOPK) who will be running for barangay captain in the upcoming barangay polls. Quijano had reportedly been trying to get hold of the master list of senior citizens in Calamba. In Barangay San Antonio, Daluz said, a letter has already been distributed to the senior citizens informing them that the cash aid will be released inside a certain Solon compound. In Barangay Lorega, the distribution will reportedly be done at the GK Condoville, he said. Last week, Daluz pointed out that Acting Mayor Edgardo Labella issued a memorandum reminding the City Treasurer’s Office, the Department of Social Welfare and Services, City Accounting Office, and the Association of Barangay Councils, reminding them of CO 2453. He ordered that the distribution of financial aid be done in barangay halls or sports complexes in order to secure the public funds and ensure the safety of the disbursing officers. But Osmeña, after returning from his medical check-up in the United States last Monday, issued a memorandum revoking Labella’s order so as not to create confusion among the senior citizens. Labella already wrote the Office of the Ombudsman-Visayas on the matter and asked them to intervene so public funds will be protected. Daluz said, though, that the mayor seems to be “inducing” the City’s department heads and employees to violate the ordinance. This, he said, will expose them to administrative liability. Section 3 of Republic Act 3019 or the Anti-Graft and Corrupt Practices Act states that “persuading, inducing or influencing another public officer to perform an act constituting a violation of rules and regulations promulgated by competent authority” is illegal. Daluz asked the City Legal Office to properly advise the mayor regarding the matter. Councilor Jocelyn Pesquera, who is a lawyer and an accountant, said that if any money will be lost during the distribution, the disbursing or bonded officers of the City cannot make any claim from government entities. “This means it will become their personal liability,” she said. The legislative body is asking the executive department to just comply with CO 2453 in the distribution of the senior citizens’ financial assistance.